Traders and financial professionals work on the floor of the New York Stock Exchange at the closing bell on Monday, Nov. 19, 2018. Technology stocks continued to plunge on Monday and Tuesday, with Facebook and Apple down again. The Dow Jones Industrial Average and S&P 500 fell sharply on Tuesday and turned negative for the year as a decline in Target shares pressured retailers. The 30-Stock Dow fell 450 points after dropping nearly 400 points in the previous session. Earlier in the day, the Dow was down nearly 600 points. The S&P 500 dropped 1.3 percent, but also traded well off its session lows. The Dow and S&P 500 were up 1.2 percent and 0.6 percent, respectively, for 2018 entering Tuesday. Target fell 10.4 percent after reporting weaker-than-expected earnings for the previous quarter. The company also posted lighter-than-forecast same-store sales, which is a key metric for retailers. The decline sent the SPDR S&P Retail ETF (XRT) down 2.2 percent. Kohl's, L Brands and Macy's — which are also in the XRT — fell 8.7 percent, 12.1 percent and 3.2 percent, respectively. Five market experts break down how to invest as interest rates spike from CNBC. "This looks like lingering worries about what triggered the October decline. 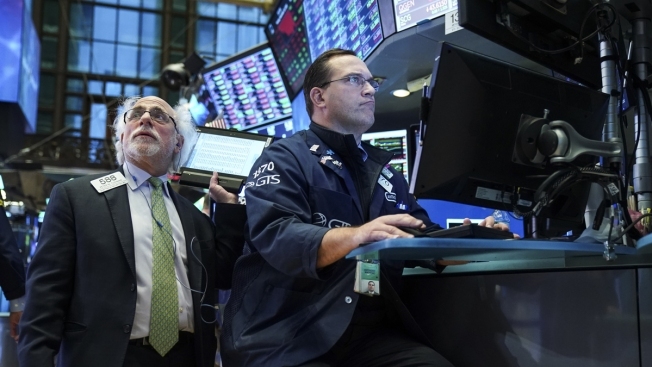 That's worries about an economic slowdown," said Craig Callahan, president at Icon Funds. "I think these people are wrong, but they're in control at this time." Tuesday's decline came a day after members of the popular "FAANG" trade —Facebook, Amazon, Apple, Netflix and Google-parent Alphabet — all closed in a bear market, down more than 20 percent from their 52-week highs. The S&P 500 and Nasdaq dropped 1.7 percent and 3 percent, respectively, on Monday while the Dow fell 1.6 percent. Apple has been leading the charge lower for FAANG stocks as investors worry sales for the company's flagship product, the iPhone, will slow down. Most recently, Goldman Sachs slashed its price target on Apple on Tuesday, noting that "in addition to weakness in demand for Apple's products in China ... it also looks like the balance of price and features in the iPhone XR may not have been well-received." Meanwhile, Facebook is down sharply amid backlash for how the company has dealt its handling of the platform's use by foreign entities to disrupt the 2016 U.S. election. "Short term, unexpected weakness in the tech sector could have a significant impact on the global economy, adding to what already looks like a soggier macro environment," said Dario Perkins, managing director of global macro at TS Lombard, in a note. "Additional retrenchment in the FAANGs could also undermine the broader US stock market." FAANG stocks were down sharply again earlier on Tuesday, but regained most of their losses in late-morning trading. Amazon, Alphabet and Netflix were higher as of 11:40 a.m. ET, while Apple remained down 3 percent. Facebook shares outperformed, rising 0.9 percent. Boeing shares fell 1 percent Tuesday after the company canceled a conference call with airlines to discuss the systems on the 737 MAX model. Last month, a 737 MAX crashed and killed all 189 people on board.